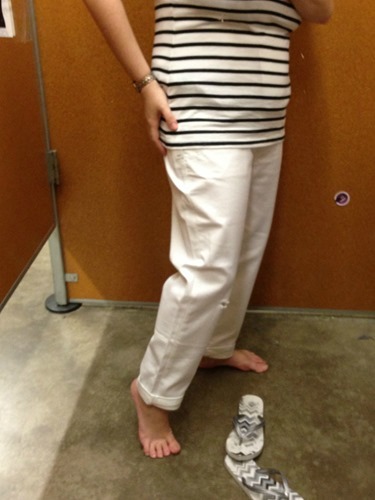 Through my membership at Crowdtap.com I was chosen to be an Old Navy Style Council member! 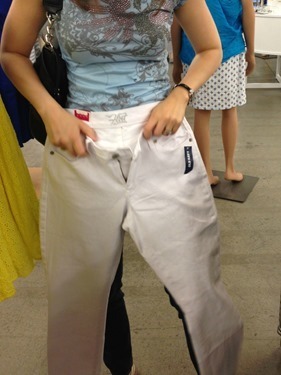 I was so excited because I really do love Old Navy. 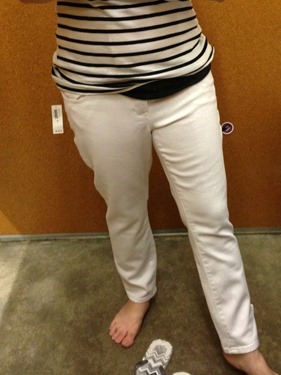 I was given the amazing opportunity to go to Old Navy and redeem a coupon for a pair of white jeans. Plus, I got to share the opportunity with a friend! 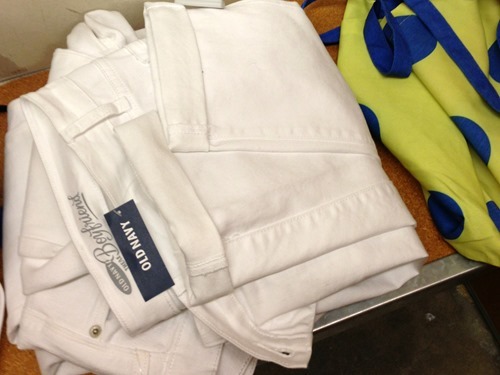 When we walked into Old Navy, we were amazed (and a bit overwhelmed) by all of the white jean options available. 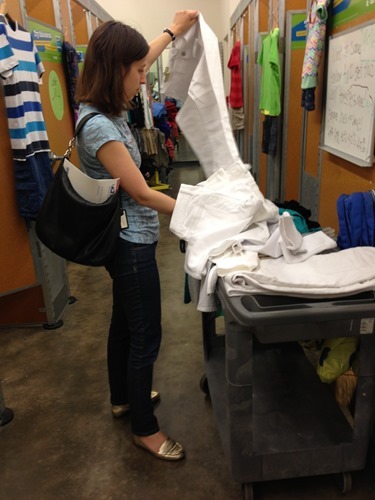 We didn’t know what sizes we were or what style we wanted, so we ended up bringing some large piles of jeans into the dressing room! Did you know Old Navy has 5 denim styles? There’s the Rockstar, the Boyfriend, the Diva, the Flirt, and the Sweetheart. Then, there are different leg opening styles – skinny, super skinny, and boyfriend. Since I’m pretty short, I decided I wanted to get a cropped pair of jeans. Unfortunately, they reach my ankles when I guess they are supposed to reach my calves! That’s ok though – I can roll them up for that shorter look! I never thought I would prefer to wear skinny cut jeans, but the Boyfriend cut turned out to be too large on me! I ended up choosing the Rockstar Cropped jeans. 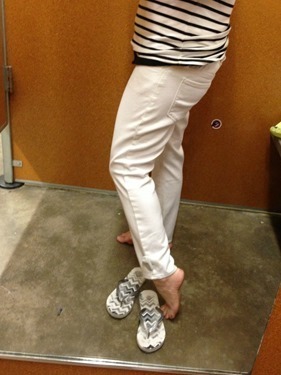 Here I am trying them on! My friend chose the Flirt cut. I didn’t get a picture of her trying them on, but here she is pretending! White jeans are one of those things you either love or hate…I hope I don’t get them covered with dirt as soon as I wear them! I do love how they match with any colorful t-shirt or blouse. They also looked pretty cute with the shirt I was wearing when I tried them on! And I think they’d look awesome with the infinity scarf I posted about yesterday – don’t forget to enter my giveaway for a kids’ scarf! Previous Post Mommy and Me Infinity Scarves + Giveaway!